Beetle, Inc. proudly introduces the new Bill Sauerbrey designed “Beetle 14”. After numerous inquiries over the years for a Beetle Cat with seats, Bill was given the task in the fall of 2006 to design such a boat. 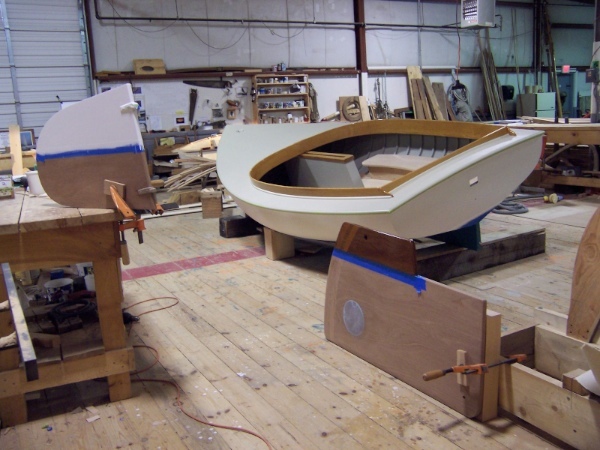 Drawing from his early catboat experience at Mystic Seaport with the Breck Marshall (a Cape Cod Crosby catboat), taking lines off many others such as Gil Smith’s Great Southbay cats for Mystic’s archives, his 12 years of experience building the Beetle Cats, and his most recent completion of the historic 28′ Hanley catboat, Bill set about designing a truly classic Cape Cod Catboat. 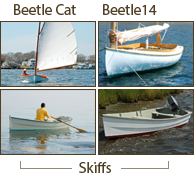 The Beetle 14′ catboat is cedar planked over white oak frames, with a canvas deck and oak coamings similar in style to the Beetle Cat. 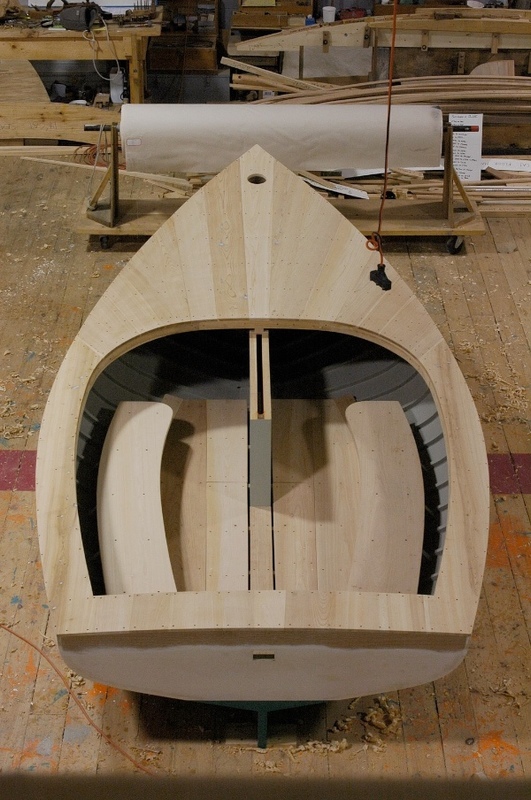 While only two feet longer in length, the boat is actually 80% larger in volume. This is evident in her roomy cockpit which seats four adults comfortably. The interior of the boat is painted using classic paint colors from Kirby’s including various shades of Mystic French Gray and Grand Banks Beige. The standard hull colors are the traditional white topsides and green bottom. Again, Bill turned to Kirby’s paint and blended his own mix for the deck and we named the new color Oyster Buff. Bill added pattern maker to his resume when he made the patterns for the casting of the custom bronze stemhead fitting, mast band, gooseneck, and traveler pads. The spars are made from Sitka spruce and are finished off with bronze hardware and blocks. 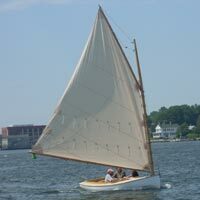 The 163 square foot sail was designed and built by Doyle Sailmakers of Buzzards Bay. Standard are two sets of reef points, while the Beetle Cat has just one, a topping life, as well as more purchase on the peak halyard and mainsheet. These changes, in addition to more depth of hull with less fullness forward, make her easy to handle and fast. 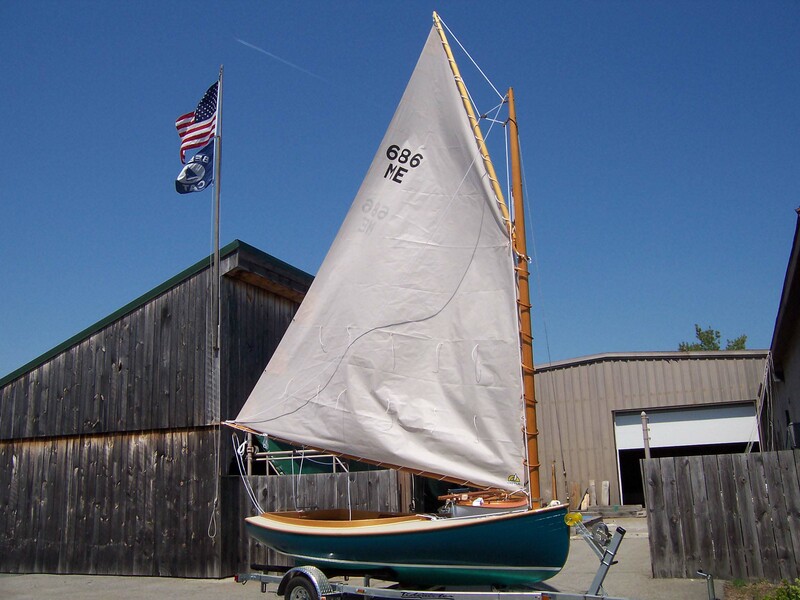 A Sunbrella combination sail and cockpit cover is an option, with the standard color Aspen complimenting the Oyster Buff deck. A customized Tidewater trailer allows for transportation of the boat. Lead Ballast – 500 lbs.